Today, we show you Java Servlet Forward HTTP Request Example that demo how to forward an HTTP Request from a servlet to another servlet. In order to do a forward action you should use the forward method of the RequestDispatcher. This method will forward a request from a servlet to another resrouce. The resource can be either another servlet, JSP file or HTML file. 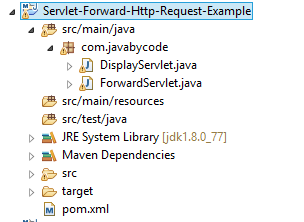 This is eighth post of series of Java Servlet Tutorial. This series tutorial will provide you full knowledge about Servlet 3.0. You should know that the forward method of the request dispatcher the URL is the same as the requested URL. You can see the screen shot for detail.